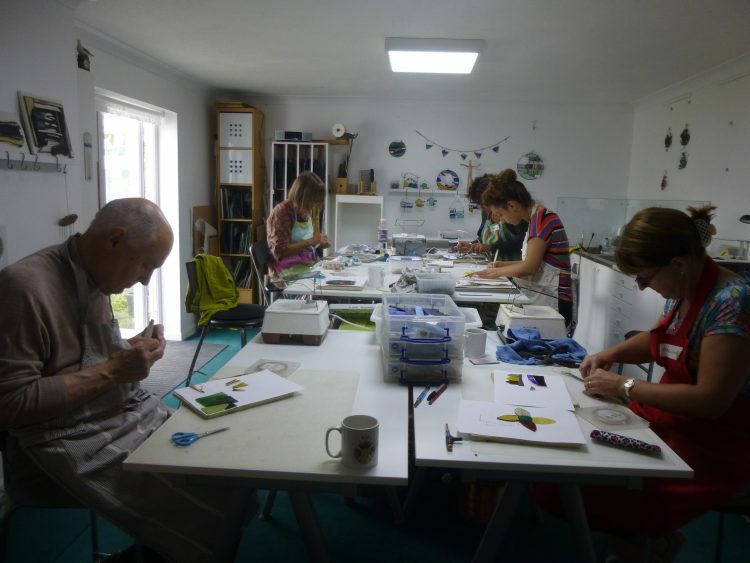 Over to Felixstowe today, to the studio of stained glass artist, Naomi Brangwyn, for a one day workshop. I met Naomi when we invited her to show at this year’s Lexden Arts Festival. 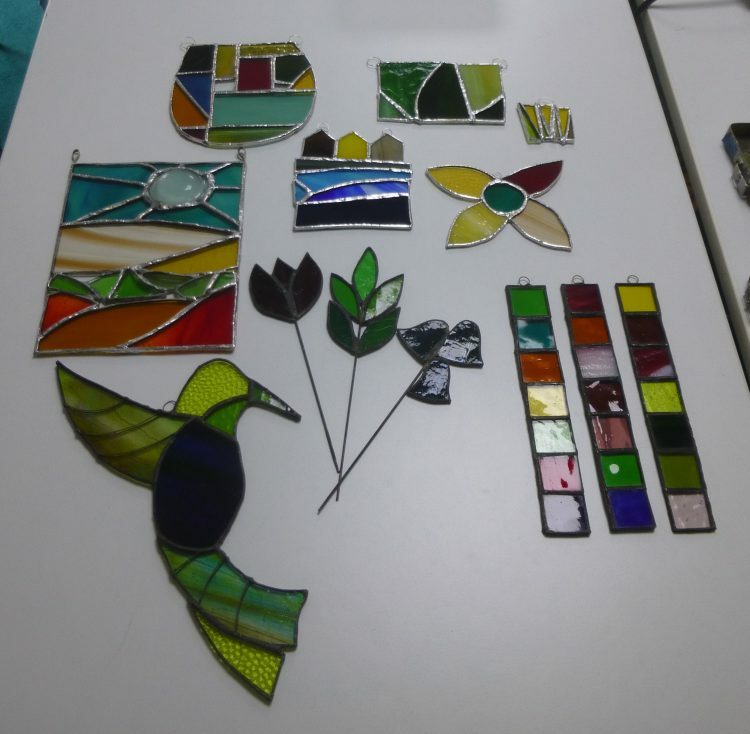 I’d often thought I would like to have a go at stained glass, so the opportunity to do a one day workshop with Naomi was great. We were a small group of six students, three beginners (including me! ), and three with varying experience. I had planned to make a design showing an anvil inside a horse-shoe – alluding to my house name The Anvil House – but once I’d done some practise cutting using a diamond cutter I realised that this was far to ambitious to start with, and I changed my idea to just a horseshoe! First we had to cut the glass pieces to fit. 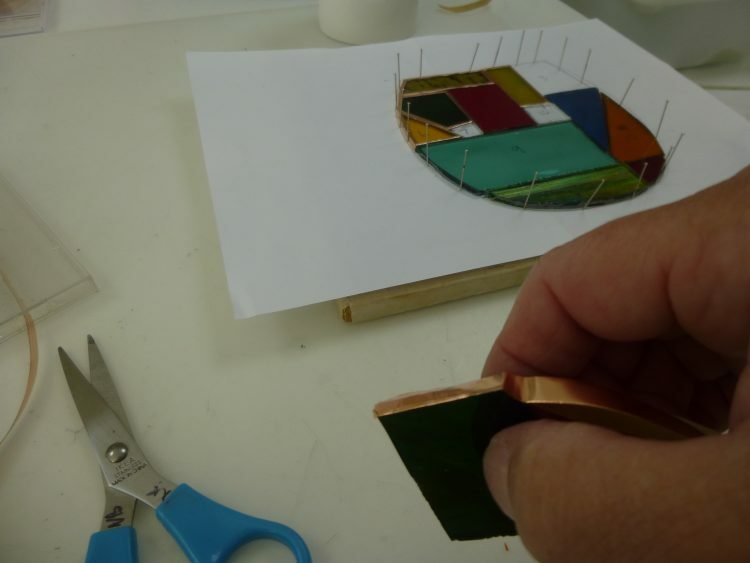 Next, having lightly ground the edges to make them safe to handle, we fitted copper foil around each piece. 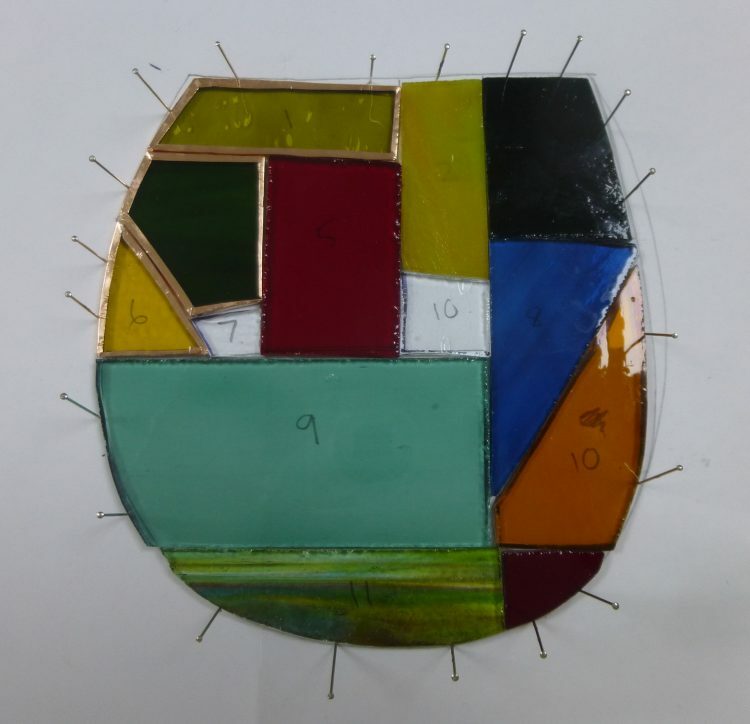 The pieces were anchored into position with pins into a soft board, to ensure that the overall shape did not become distorted. 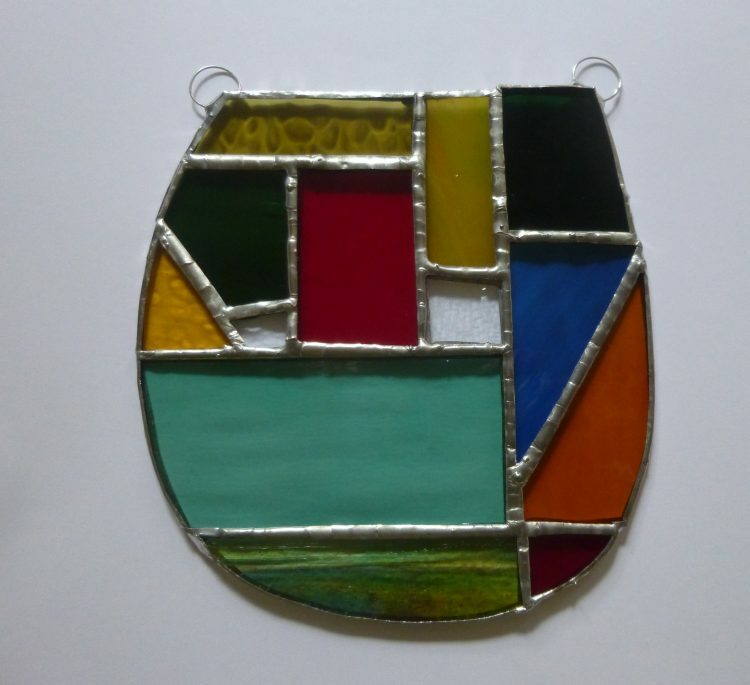 Partly foiled, in the top left hand corner! 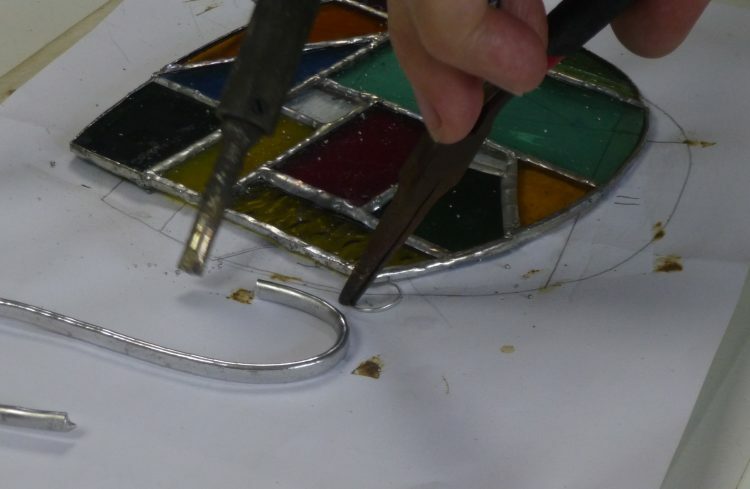 Once all the foil was on, we brushed flux over the edges, and ‘tacked’ the pieces in place with blobs of solder. This was then extended along all the edges to make continuous joins. 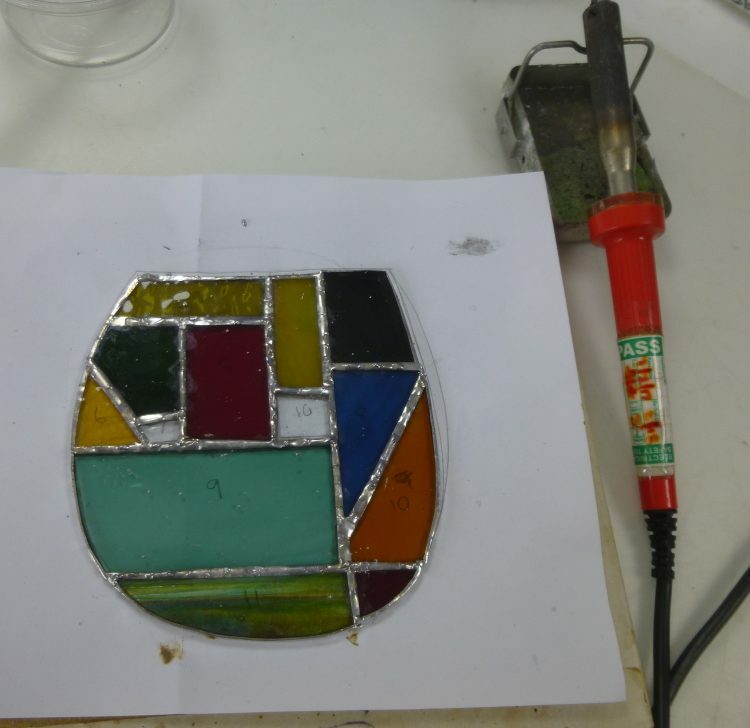 At this stage it looked very mucky, with the sticky flux, and the blobby solder! 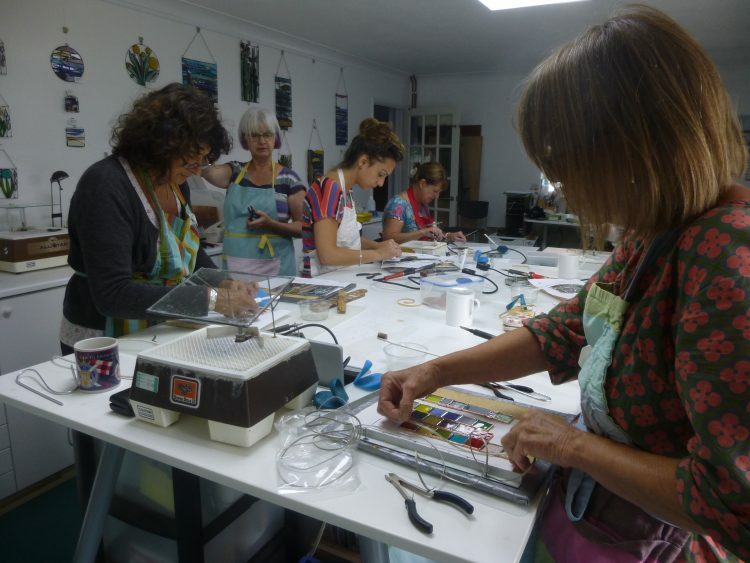 We then ‘beaded’ the solder – very tricky! – to make smooth raised lines. Mine were not very smooth nor very raised but I learned a lot. When I’d done both sides Naomi put the hanging rings on for me, as this is really difficult. We all had a really good day . . .
. . . and the results were amazing! And here is a close up of my horse-shoe, after it had had a good wash!